Hello everyone, my name is James Hawker. I am the Queensland State Manager your Freedom Experience Consultant. I am one of the very lucky people who gets to live and work in this great state of Queensland. What is the Freedom Experience? Freedom Motors Australia is not just about modifying cars into wheelchair accessible vehicles. It is about a positive experience from the moment you contact us, and the years that follow enjoying the Freedom Conversion. I moved to the Sunshine Coast in 2013 from Darwin (NT). There I worked with the largest vehicle dealership as their Corporate Relations Manager. One of my major roles was working with the education and Health Departments and helping them with their special vehicle needs. Working in collaboration with Freedom Motors Australia I got to build Wheelchair accessible vehicles for many remote regions in the Northern Territory. The difference these vehicles made to these communities was amazing, they just helped bring people together which is very important to any family or community. 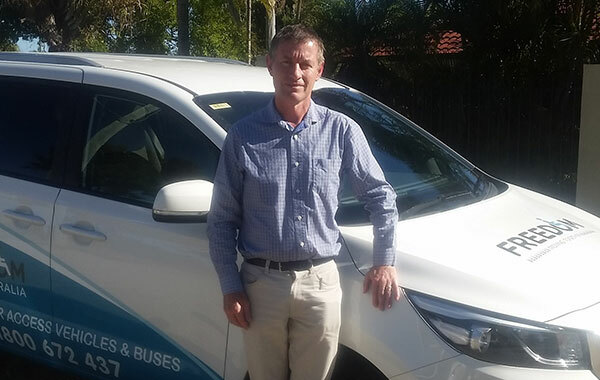 My goal is to help as many people in Queensland get their independence back and help families to all travel together in safe and comfortable vehicles. Freedom Motors builds some of the best Wheelchair Accessible Vehicles in Australia. We have over 1500 clients out on the road now experiencing the Freedom and Independence our vehicles bring you.